We understand you may need to permanently delete some messages or conversations in Front. For example, when an email contains sensitive HR information or credit card details, it's possible that you wouldn't want others to see these emails in Trash or would need to remove them for privacy purposes. 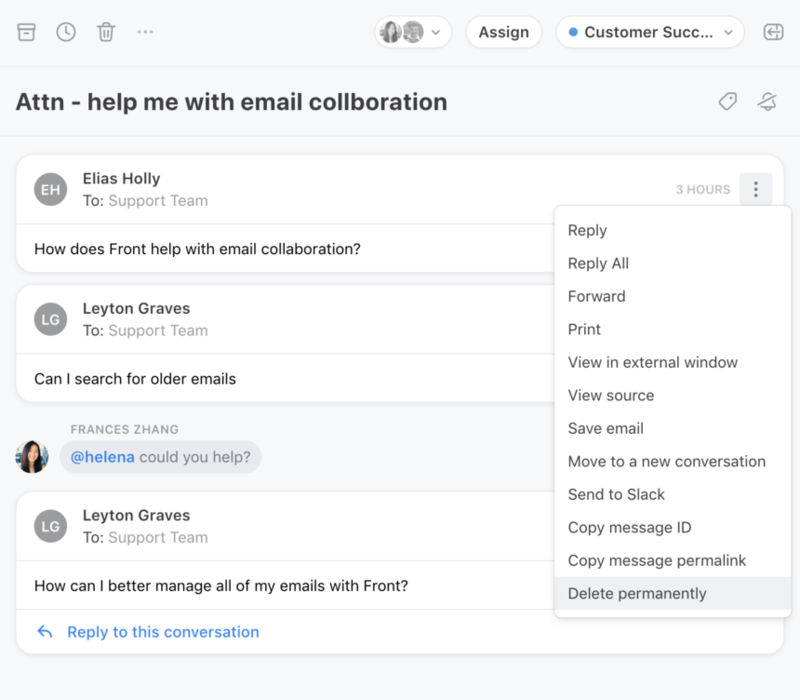 The permanent delete feature allows you to completely delete whole conversations or single messages in Front. This action is permanent and cannot be reversed by you or Front’s Support team. There is no grace period for recovering messages or conversations that you permanently delete. Using permanent delete will only delete the record from Front’s servers. 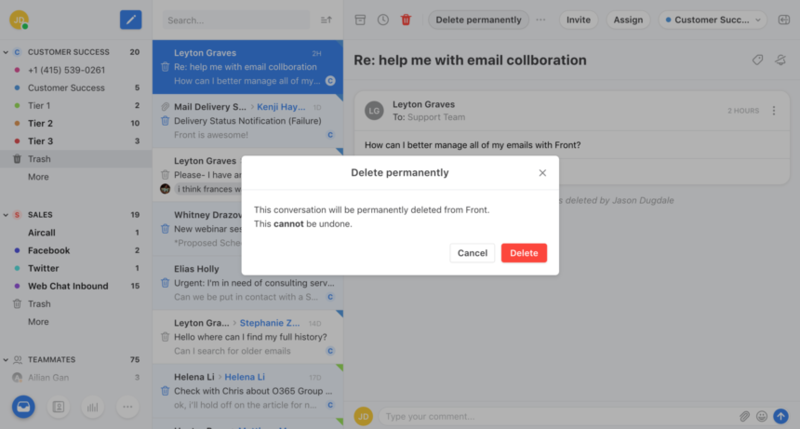 Any records of the messages that exist in other email clients and servers (like Gmail or Office 365), or on the servers of other channels like Twitter or Twilio will not be deleted when you permanently delete a message in Front. 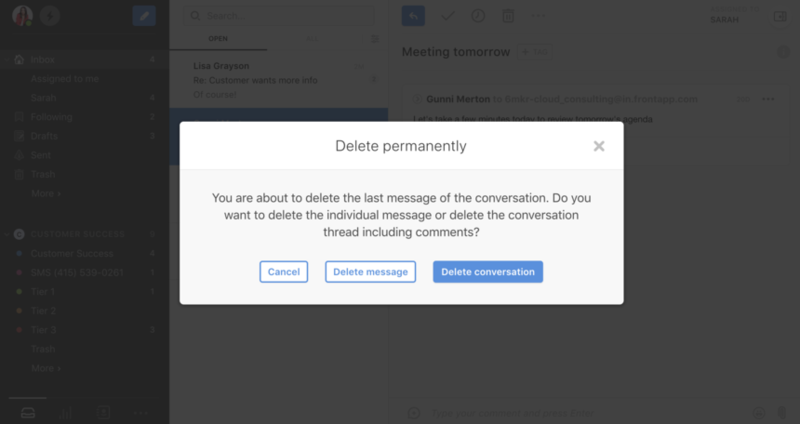 Company Admins and Team Admins are able to permanently delete messages or conversations in team inboxes. If your team is using custom roles (available on our Enterprise plan), there is a custom permission Admins can use to grant this option to Team Members or other custom roles. 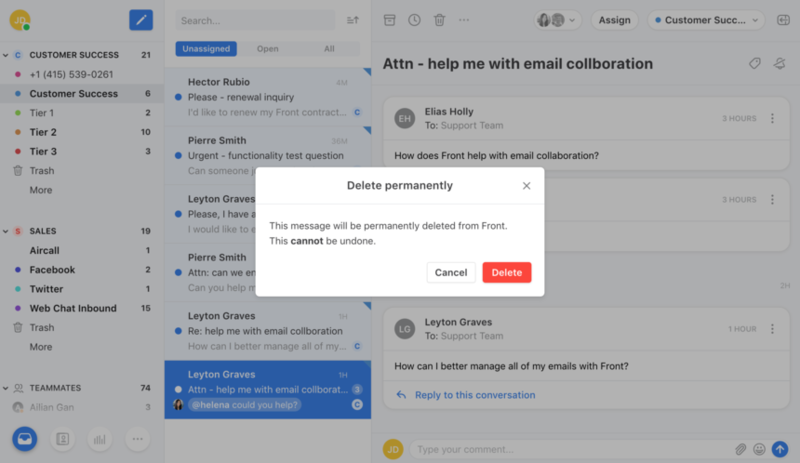 All users can permanently delete private messages or conversations in their own individual inbox. Open an email conversation, and click the message options menu in the top right of the message you want to delete. A warning will pop up to confirm permanent deletion or cancel action. Click Delete permanently. There will be no activity line in the conversation to record the change. If you are deleting the last message of the conversation, you will be prompted in the popup to choose whether you want to delete the message or the conversation. If you press Delete message, the conversation will be preserved with the comments and tags but the message will be deleted. If you press Delete conversation, everything will be deleted including comments and tags. Open the conversation you want to delete. Click the trash icon at the top of the message to move the conversation to Trash. Open Trash and select the conversation. If you want to delete a conversation already in Trash, just find it in the list. Click the Delete permanently button at the top of the conversation. A warning will pop up to confirm permanent deletion or cancel action. Click Delete to confirm. You cannot "select all" in Trash to permanently delete all conversations or set a rule to delete certain messages automatically. You can hold the shift key while selecting multiple conversations in Trash to delete conversations in a batch. Richard Lavigne Yes, we hope to build this capability in the future! Will keep you posted.